I am off to spend a couple days with my oldest cousin. He is of the pre-digital age and I may not have internet access for a while. 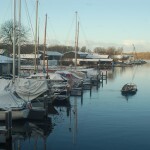 On January 2nd I go to Soest to house/dog sit till the end of January. Wednesday morning I went to the airport to welcome Corrine’s dad, Brett and her Grandfather Tony and his wife Sandy. They are in Amsterdam till the 30th and then fly to Geneva to watch Corrine and her boyfriend Euen and his family ski in the French Alps. Then they come back on the 3rd and return to Seattle on the 4th. 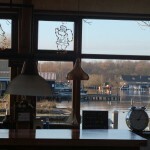 Later on Wednesday I visited Els van Ommen, my uncle’s second wife. She is 8 years older than I am. Then my cousin, Else’s step son, took me along to Heemstede where I stayed the night and met his older brother, my cousin Hans van Ommen. I feasted on the left over Turkey. It tasted like a delayed Thanksgiving surprise. No white Christmas here. Just wet and dreary. I hung out some more saltwater soaked items from the bow section that just never dry with the salt still in it. I can count on the rain to rinse them while I am away. If I do not get the internet connection before the 31st. I wish every one a Happy and Prosperous New Year. America is just waking up on the Atlantic Coast. 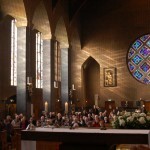 I am back from the second Christmas mass at the Augustinus Church. 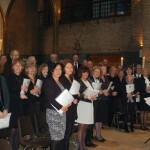 We had our choir’s general rehearsal on Sunday afternoon, with the soloists and musicians. We sang the midnight mass last night and left the church at just before 2 a.m. Then we reported in at 10 a.m. again for the 11 a.m. service. This experience will always remain one of the highlights of my four year European visit. All the hard work and rehearsals were worth it. In the end I think we all, as a choir, enjoyed this as much as the congregation who could just sit and enjoy the music. Last night we sang the liturgy from Mozart’s Krönungs Messe (Coronation Mass). 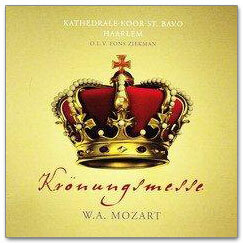 Which is very similar to Mozart’s Requiem Mass. 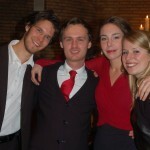 The four soloists were Nikki Treurniet (Sopraan), Merlijn Runia (Mezzo-sopraan), Aart Schutte (Tenor) en Tim Maas (Bariton). Fabulous voices. They are all students at various conservatories in Holland and Tim in Hamburg. (see my December 6th blog with details of the program and participants, director,violinists, etc.) The large church was packed. This morning we did not have the soloists and instead of the Mozart mass for the liturgy we used William Lloyd Webber’s Principe Pacis Latin mass. This was familiar for most of the choir but totally new to me. But with the help of very strong tenors on both sides I managed to get most of it and I am allowed to come back for the Easter rehearsals. Right now I am at my sister and brother in law for Christmas dinner. Tomorrow morning I go collect Corrine’s dad and grandparents who are flying in from Seattle, then I’ll stay a few days with my cousin Gido van Ommen and his wife Riet in Heemstede. On January 2nd I move to Soest till the end of the month. So, a warm bed in the coldest part opf the winter. I talked on the telephone to the last survivor of the infamous May 22nd 1944 arrests of seven Resistance members on the Van Breestraat 155, as is described in “The Mastmakers’ Daughters”. He is Jan Eusman, he was then 24 and is now 92. I will be visiting him after he has read the book and the information that surrounded the event of which part was most likely never known to the rest of the group of seven. And I hope to get some new facts from him. And the days are getting longer again. We’ll sing at Christmas “In the Bleak Midwinter”. I can hardly wait to see the Chestnut here at the club sprout its flowers, get the boat rebuilt and take off for warmer parts in June. I think that my cold will be done with by Christmas Eve. The worst is over, it interrupted my choir practice last Wednesday, several times. The 50 books that came in 10 days ago are down to 16 with several already spoken for. And the orders are also steadily coming in to the publisher. Thank you everybody! I think that I shall be able to send off the English version in ready to print format in the next day. The full choir sang at the fourth Sunday of advent. We used Haydn’s Missa Tempore Adventus for the liturgical songs. The communion and rececessional songs were in English. Nothing in Dutch. You would have felt right at home. It was also father Bakker’s Birthday. The vestment and last advent candle colors were purple, what better occasion than to give father one of the purple covered “De Mastmakersdochters”? The first batch of fifty copies of the book arrived last Thursday and I will have to put an other order in soon. I also thank everyone who has already purchased a copy from the publisher’s web site. I have come down with a nasty cold. Tomorrow is the last choir practice for the Christmas program. Please, pray that the cough will be gone by then. 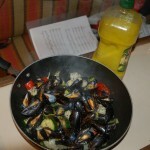 Yesterday evening I did have company for my “Moules a la Fleetwood”. My granddaughter came over with three of her PLU student friends. 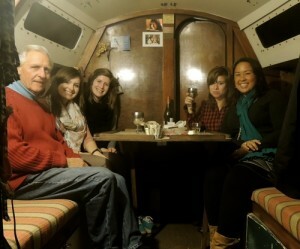 Katherina Cheng wrote on her blog about her visit and the Musselman on her blog at: http://nomadictude.tumblr.com/ She has a writer’s talent and all of these 4 young women have a brilliant future ahead of them with the education, interests and energy they have. I am certain that their 6 opas are just as proud as I and Opa Spencer are of our granddaughter, Corrine. And of their sons/daughters who raised them. It dropped a couple degrees below freezing, last night. A cold ride on the bike to choir practice. But we all prefer bright skies and cold weather over the grey wet days. The clubhouse is all dressed out with christmas tree and decorations. Where can one find such a pretty spot so close to the center of Amsterdam? And when I should get tired of it I can throw off the dock lines. But I was glad to be able to accept the invitation from my brother in law when it dropped to at least 10 degrees centigrade below freezing. In the below picture you’ll see what happened to my olive oil, at that temperature. I’ll be sure to add some antifreeze to the next batch. Yesterday I sen out a notice of the launching of “De Mastmakersdochters” to all my Dutch friends and family (over a hundred addresses..) and the orders are rolling in to the publisher. So, it starts to feel like Christmas for me and, I’m certain, for the readers. It is difficult to believe that I could not seduce any one to share my yesterday’s dinner. No one can cook mussels like my Wok recipe, not even Chez Léon in Brussels. This meal cost me less than $4. The mussels for two cost Euro 2.77. Try that at Chez Léon. For reservations, parking is free after 5 p.m., call Chez Jacques at 0639884848. Monday December 10. I’m stuck for words. The printed book with color photographs is available at €20 plus shipping and the E-book at € 8,50. I decided to by-pass the the mass internet distributors and the retail book stores, which would have added about €10 to the price. I am counting on you to spread the word, after you read the book. 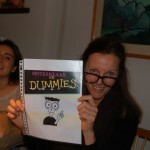 I am working on the web site www.DeMastmakersdochters.nl to further promote the book. This is a unique story about a very special woman and her group of 200 women prisoners, how they managed to survive Dutch prisons and three German concentration camps. Two cousins by the same name but yet going into two totally different directions. It is different from the standard Second World War story. It takes a look at the suffering, sacrifices Fascism forced on the German population. Did you know that the third largest prison population, after the Poles and Russians, at Ravensbrueck were Germans? Do you have any idea of the number of Dutch female prisoners executed by the Germans, other than Hannie Schaft? I made many more discoveries that are not common knowledge, yet. Ik ga nu even werken op Uw wereld bekende Hollands goede geweten. Koop het boek! Mijn moeder en ik danken U bij voorbaat. Ik heb het geld hard nodig. En dat is het minste dat U kunt doen om Uw waardering voor deze blog te betogen. Maar ik verkoop mijn ziel niet aan de Company Store. Ik blijf U vervelen met mijn rapporten over welke kerk ik de laatste zondag bezocht. Thursday evening there were just a few club members who braved the weather. I had just settled on the pricing of the book. Paul Beving put his €20 on the bar. This earned him the distinction of being the first buyer. A while later three friends joined us, in my euphoria I ordered drinks. But my club card was short of credits and I did not have my wallet with me. So the €20 went back to the club for another chit card. So, the moral of the story is: your €20 or € 8,50 is not put under the mattress. My brother in law, Herman, saved me from going into the deep freeze. The mercury dipped to minus 10 centigrade on Friday night. Lisa, Corinne and her boy friend Euan and I were invited in Haarlem at my nephew Dirk Jan and his partner Fransje‘s home for another Sinter Klaas experience. My daughter Lisa (my # 1) and my nephew Dirk Jan (my sister’s first born) are six years apart. They had not seen each other since 1983. 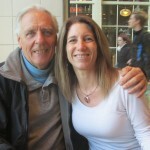 In 1976 when Dirk Jan was 18 and Lisa 12, Dirk Jan stayed with us in the Pacific North West. I had bought my very first sail boat that year. He was on our first overnight cruise. I hooked up to a mooring buoy in a bay on the island of Cortez in the San Juan Islands only to discover that it was a crab pot float, the next morning, floatig in the Straits of San Juan de Fuca. The moral of this story is: Do not be discouraged. 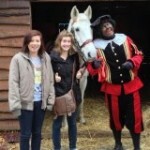 Fools can eventually circumnavigate. The Dirk Jan de Ruiter/ Fransje van Luin family are the Dutch Family Robinson. After dinner we climbed up to the attic. Lukas, 12 year old plays virtuoso on their baby grand, 16 year old Daniel plays the tenor saxophone, Fransje the soprano sax. Euen played the base on their guitar. And they just Jazz jammed. My favorite “Take Five” from Dave Brubeck and many more. If I can be taught to put a book together would it be possible to learn to play an instrument? I spent the cold Friday night in a warm bed at my sister’s and Herman’s home. Saturday morning I waved Lisa out on her way back to SeaTac. I am so blessed with my children, wished she could have stayed longer. Second Sunday of Advent I attended the local R.C. church. A woman lay preacher led the service. The name of the church is “De Engelenbewaarders“. Which translates to “The Angels Keepers”. Unusual. The parish celebrated its 75 th anniversary this fall. The interior walls are painted in sort of a Hieronymus Bosch style. Distracting. But maybe if I would have attended all of the 75 years I’d be perfectly comfortable with it. 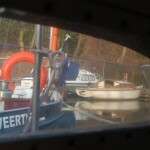 Tomorrow I shall go to pick up 50 copies of “De Mastmakersdochters” at the printers in Alphen a/d Rijn. This Sunday there is a socal gathering at the Yacht Club and a book auction in the evening. I expect to sell a few of the books to the club members and Paul Beving will get his # 1 issue. I will also deliver/mail a book to the group of Dutch editor friends who made this happen. U bent van harte welkom om de Kerstmis mee te vieren in de Augustinuskerk op de hoek van de Kalfjeslaan en Amstelveenseweg. Ik zing mee met de tenoren. In een paar eerdere blogs heb ik al wat van het koor verteld. Voor mij belooft dit een van de meest indrukwekkende vieringen te worden van de geboorte van Jezus. Ik heb ook al eens eerder reclame gemaakt voor de pastoor Bakker in dit forum. Zingen en Zegen zijn Zeker. Krönungsmesse. Deze mis is origineel gecomponeerd door Mozart in opdracht van de aartsbisschop van Salzburg in Maart 1779. Maar de mis kreeg haar huidige bijnaam toen dezelfde mis nogmaals weerklonk in 1791 te Praag bij de kroning van Keizer Leopold II tot Koning van Bohemen. En nu, 221 jaar later, gaan wij daar met het LPK een mooi vervolg aan geven onder leiding van dirigent Herman Paardekooper, met orgelspel van Vincent Kuin en met medewerking van de solisten Nikki Treurniet (Sopraan), Merlijn Runia (Mezzo-sopraan), Aart Schutte (Tenor) en Tim Maas (Bariton). Tevens hebben wij twee violisten, n.l. Lucia Boeken en ons eigen koorlid Tony Rous (voormalig 1e violist van het Concertgebouw orkest), die de vaste delen extra muzikaal zullen ondersteunen. Vanzelfsprekend laat u zich niet alleen door Mozart inspireren deze nacht, maar ook door de werken van Strategier, Ellis, Darke, Berlioz, Huibers, Saint Saens, Willcocks en niet te vergeten het eigen werk van onze pater Bakker. Wij zijn zeer benieuwd hoe Kerst deze keer opnieuw door onze pastoor zal worden ingeluid en ons allen helpt om de juiste weg te blijven bewandelen in de donkere nachten van December met het felle licht als stip aan de horizon. Het Latijns Parochiekoor hoopt u te begroeten in de Kerstnacht of op de 1e Kerstdag om 11.00 uur als wij wederom “acte-de-présence” mogen geven. Tenslotte wensen wij u allen een gezegend Kerstfeest en voor het nieuwe jaar een goede gezondheid met veel mooie, inspirerende, muzikale momenten! Lisa, Corinne and I drove in our rental car to Bruges, Belgium on Monday evening and stayed the night. We made a quick tour of the city, the Grand Place, the Our Lady Cathedral, Bequinage. But it was cold and dark and the landmark Swans in the city moats looked cold and distracted. We needed the sun to shine through the magnificent stained glass windows. And I told Lisa she has tio come back in the late Spring to smell the Linden blossoms. 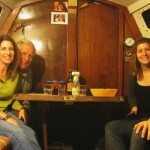 ( see the blog http://cometosea.us/?p=1420 when hers sister Jeannine was in Bruges on July 13 2010). Then we made a sentimental journey to Halle, where Jeannine was born in 1969, and on to Ittre where Lisa lived with us between 1968 and 1970. 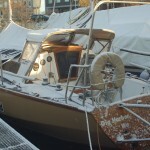 It snowed yesterday on St. Nicholas Eve. 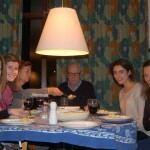 My sister Karolien and Herman invited us for the St. Nicholas Eve celebrattion. We exchanged gifts, sang the traditional St.Nicholas songs and after a delicious dinner we played “Sjoelen” a traditional shuffle board game. 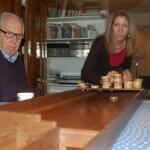 The “Sjoelbak” was made in the Mastmakers shop and the last time I ever played this game was in 1956. The entire de Vries family would gather every new year’s eve at my grandparents home and we would play on this same board. Corrine was the champion of the evening and it ended up America-Holland, 2-1. “De Mastmakersdochters”: The first order has been put in with the printer and I shall have books available within 10 days. And I expect to be able to give you details on where and how to obtain the printed and electronic version within the next days. I decided, in order to keep the cost down, to bypass the mass distributors and bookstores, and to distribute the book through the publisher Boekhandel Heijink. 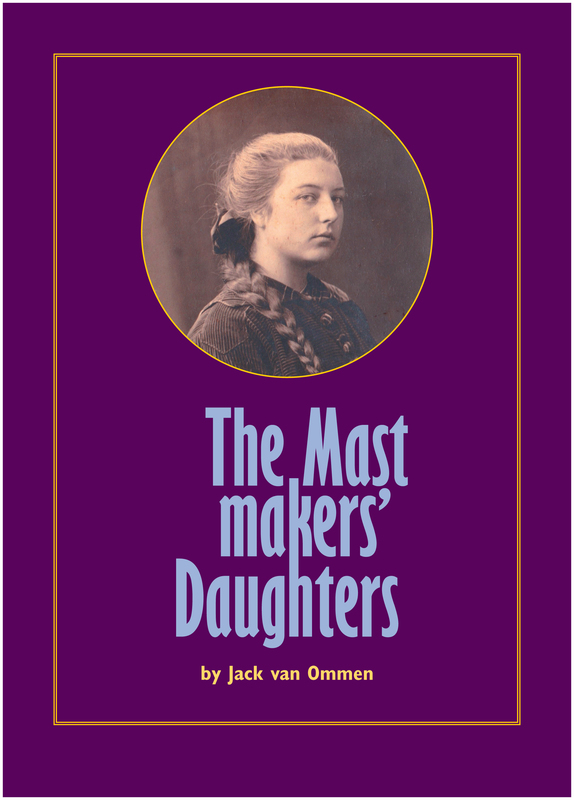 I plan to have a dedictated web site for the book at www.DeMastmakersdochters.nl and www.TheMastmakersDaughters.us . This week I took a holiday with Lisa from the English version but will try and have it all finished by the end of next week. My Christmas deadline. Lisa landed this morning in Amsterdam. Her daughter Corrine, who is studying here in Amsterdam and her boyfriend Euen were at the gate as well. Lisa is staying with Corrinne in her student housing right across from the Amsterdam Maritime museum on the Prins Hendrikkade. 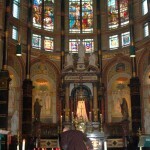 I went to 10.30 mass at the Saint Nicholas church also on the Prins Hendrikkade across from the Central Station. And it was appropriate because this is the week of Saint Nicholas. The feast is on the eve of his death, December 6th. My home parish in Gig Harbor, since 1984, is also Saint Nicholas and he is the patron saint of the seafarers. I am convinced that Saint Nicholas has a lot to do with my safety at sea. And Saint Barbara. I started my first and longest ocean crossing, 3000 miles and 28 days at sea, from Santa Barbara, California, just after celebrating Easter at the Santa Barbara mission in 2005. She is the female patron saint of the seamen. Our Lisa was baptized in the Santa Barbara mission in 1964, when we lived there. It was another special experience particpating in the celebration today. This is not a residential area. It borders right on the Amsterdam red light district. But this large old church was more than 75% full. And the majority are locals and quite a few young families with children. The singing was exceptional. It took me a while to figure out that the choir was not in the loft behind me and not 20 plus voices but right behind the altar and only 6 voices. The accoustics are phenomenal, no microphones and the sound was all around the church. Next weekend this church will be upgraded to a basilica. The sermon and service was outstanding and I feel again very priviliged to have been there and start the preparation, in the first Advent Sunday, for the Christmas celebration. Lisa, Corrine and Euen came to the boat for dinner and afterwards I had an opportunity to introduce them to a number of my Schinkelaars yacht club friends who gather at the club house. Lisa is going to visit the Noorder Mark(e)t tomorrow with her cousin Dirk Jan. And we plan to drive in the early evening to Brughes in Belgium, stay the night there and then continue to Ittre to show her and Corrine where Lisa lived from her 2nd to her 6th birthday.